Looking back on family trips, you never really remember the fun times you spent in a hotel room, but you do remember the times you spent drinking wine on the patio or cooking breakfast in your pajamas in a vacation rental. We love having the grandparents join us – not only because they are built-in babysitters (an added bonus for tired parents) but because they really get to enjoy the little day-to-day joys of being with their grandkids, like bath time and the simple things they usually miss out on. It is important to note that the process is a bit more involved than booking a standard hotel room; however, the savings you can achieve- as well as the additional space and privacy you get when you arrive are definitely worth the extra time spent planning. Not to mention, most importantly for us, the added enjoyment, togetherness and memories created! Since most vacation rental travelers book their accommodations about 80 days out, you’ll want to start with a site like HomeAway.com or VRBO.com to give yourself plenty of options. HomeAway has more than 315,000 listings and VRBO has about 190,000 listings, so using one of these sites, you’re sure to find something that meets your family’s needs and budget. Reviews can be extremely helpful in wading through the property options and also providing yourself with reassurance that the listing is as it seems. I look at reviews immediately after photos and price. It can instantly sell me on a property if others travelers have given the home a glowing review. As a parent, this is one of if not the most important parts of the process for me. I always make sure to get the homeowner on the phone and have a lengthy conversation about the property and the area to make sure it’s safe and appropriate for my family, since I have two girls under 3. At this stage, I can ask questions about how kid-friendly the property is, what all comes with the rental (unlike a hotel that always has shampoo, hair dryer, etc. the amenities vary from home to home), and how close the property is to the attractions in town. Also, I’ve found that the homeowners can be like your personal destination guide, giving you recommendations on restaurants and attractions and helping you navigate a new city. I always say, act like a nosey neighbor and get all your questions answered ahead of time! In case of any issues and so you’re clear on exactly what to expect with your rental, make sure to sign a rental agreement that clearly outlines things like the check-in/out times, cancellation policies and clean up expectations. To have it all in one contract also helps to keep you organized and prepared for your stay. Paying by credit card or another online payment method like eCheck or PayPal is the best way to securely book a vacation rental. More and more vacation rental owners are offering this as an option, especially when you use sites like HomeAway which has a free tool called ReservationManager, so it shouldn’t be difficult finding a property that accepts online payments. If they require you to pay in cash, consider that a big red flag and move on to your next choice! 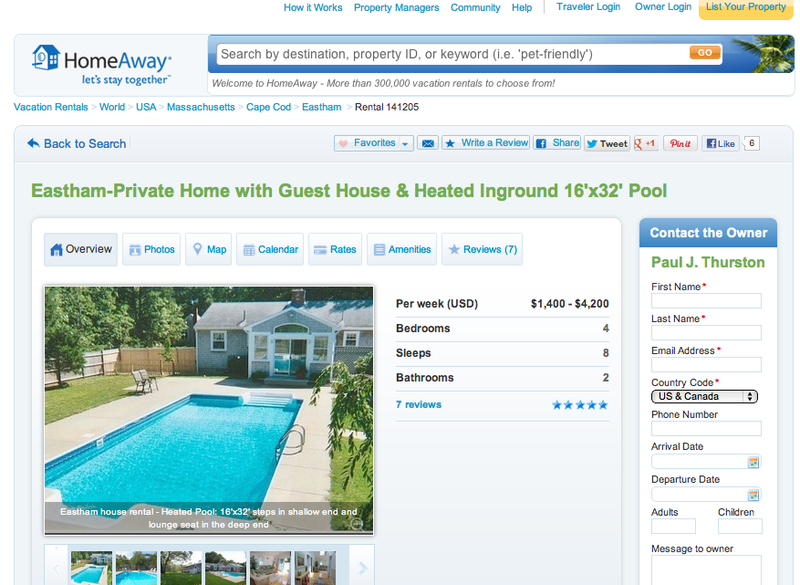 As another point of interest, HomeAway recently partnered with Priceline and so now travelers who book through Reservation Manager on HomeAway can also book a rental car and airfare through the same interface – very helpful for busy moms like me who don’t want to search a bunch of different sites! The staycation is OVER this summer. Or at least is is for my family. Having two little ones, I’m always on the hunt for ways to save a few bucks – but this summer I’ve discovered the secrets to save up to $1,000 on your vacation. When trying to think of when and where to go, travelers should keep in mind the rules of supply and demand – when demand exceeds supply (as it typically does in popular summer vacation destinations), prices go up. Therefore, if you’re dates are flexible, use tools like Kayak Explore and Priceline.com to try and determine when and where flights will be the cheapest. Kayak Explore helps you “brainstorm” where to go by showing you where you can find the lowest prices on flights from your destination. Then, you can use Priceline to search for your flights. With the average domestic airfare costing around $364, give yourself a budget of $200-$250/ticket and with a family of four you’re looking at between $400-$600 in savings by shopping smart. Another tip is to use Google Maps to pick a destinations away from the tourist spot. For example, as a New Yorker, a popular place for my friends and me to go is Provincetown, Massachusetts on Cape Cod. Instead I recommend looking up destinations 20-50 miles away, like Eastham, Mass. You can save a ton on money by doing this because the less popular destinations don’t charge as high of a premium to stay there. 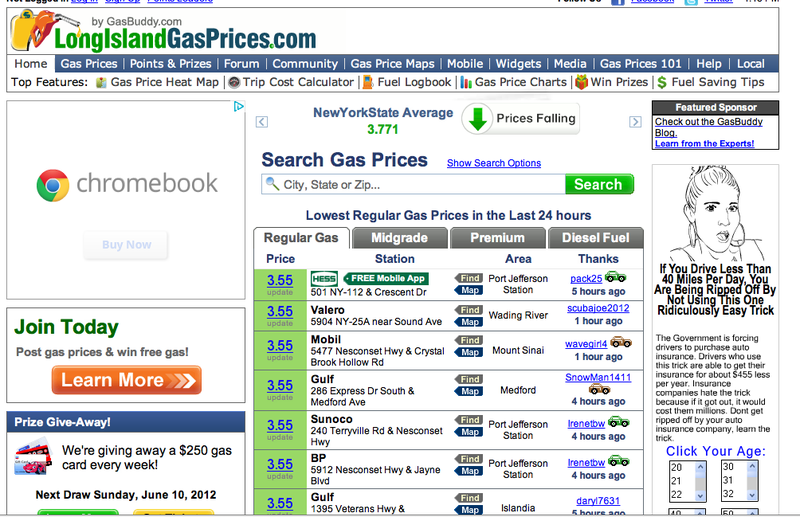 For road trips, it may not be a huge surprise, but using sites like gasbuddy.com can be very helpful in finding the cheapest prices on gas along your route. Driving is always cheaper than flying, but using gasbuddy helps you save even more by keeping you organized. So that covers when and where to go and how to get there. Accommodations are one of the most expensive parts of a vacation besides flying, so on your summer vacation, think outside the hotel box by staying in vacation home rentals. This one can be a huge cost saver for families and it’s the way I prefer to travel with the Hubs and Littles. With sites like HomeAway.com or VRBO.com you can book an entire house instead of a tiny 300-square-foot room, which also has built in savings like kitchens and washer/dryers. For a family of four, you can buy groceries for quick meals like breakfast and lunch (which typically cost around $35-$50 per meal at a restaurant) versus eating out every day and easily expect to save a couple hundred dollars over the course of a weeklong vacation. Plus, since vacations are all about spending time with family and friends, with vacation rentals, you can invite them along and share the space as well as the costs. Booking a home with multiple bedrooms, is significantly cheaper than booking several hotel rooms – plus everyone gets to spend more time together under one roof! Just as a quick example –going back to Eastham, Massachusetts, you can rent a 3-bedroom vacation home for $340/night, but if you were to try and get the same amount of rooms at The Four Points Sheraton Hotel you’d have to pay $720/night ($240/room)! While using the kitchen is obviously the best way to save money on food while traveling, no one wants to cook the entire time. So once you’ve decided on your destination, check out Groupon, Living Social and Restaurant.com before your trip. These sites are known for saving people money on entertainment in their own town, but the same rules apply while traveling. I know I’m always asking for restaurant recommendations when I go to a new destination, but using Groupon or Restaurant.com takes the guess work out of it for me and I can save $25-$50 on every meal. Plus sites like Groupon also offer discounts on attractions as well. Just be aware of the rules associated with the coupons as sometimes they are only useable certain days of the week or exclude certain food items. Hopefully these tips help you take the perfect (affordable) family vacation this summer. Remember to shop smart, but have fun! My family is spending our first ‘real’ weekend at our new house outside the city where we plan to spend lots of weekends (especially in the summer) and holidays. As perpetual travelers, I thought today would be the perfect day to let you in on my top 3 must-have products for traveling with The Littles. For now at least. I’m sure I’ll update this regularly since, as all things with kids, nothing ever stays the same for long. What’s your must-have for summer travel with babes? Watch below to see mine. When all else fails, give them something super sweet and crumbly. Mom of the year. Look closely. No idea how that many muffin crumbs got on the top of her head! Mom of the year. Road trip May 19, 2012. Then we’d get sidetracked by rare treats like fast food and gas station candy. Finally the excitement wore off and we were just tired, uncomfortable and cranky. And inevitably, “Are we there yet?” and “How much longer?” became our anthem. Here’s what I do to make road trips with Little and Littler easier. 1. Overcome the “are we there yets” with verbal distractions – Teaching them a new song – by ‘new’ of course I mean new to them . On a recent road trip, we taught the girls how to sing “B-I-N-G-O” and it was a huge hit.So is the Banana-nana-fo-fana-me-my-mo-manna game/song! We also love playing an imagination game, like having pretend tea parties. This can keep little ones (and surprisingly you as well) distracted from the long road ahead. 2. On road trips, more stuff is better! Unlike when you’re flying, you have extra space to store your extra goods – so use it! Bring additional diapers, wipes, changes of clothes and ESPECIALLY snacks to keep kids happy and clean at all times. I saw a travel tray that goes over the carseat so kids can draw, color, do sticker books and play games today that I’m consider ordering from One Step Ahead. 3. Schedule several breaks and physical games outside the car into your trip – Kids get uncomfortable sitting for long periods of time (don’t we all?) and car seats can feel especially restrictive. Although you might want to just power through the drive, make sure to schedule extra pitstops along the way to keep the kiddos happy. Also, when stopped, try to make everything a game- “Who can run to the door fastest? Who can jump up and down for 10 seconds?” A little physical activity can go a long way. 4. Have duplicates of toys if you have multiple kids – For me, having two of everything helps to prevent the “he took my…!” “I want the toy she has!,” which is especially crucial in keeping stress levels down on long road trips. 5. Technology can be a lifesaver – Investing in some type of technology, if you don’t already have an iPhone/iPad or something similar, can be hugely helpful in keeping kids entertained on road trips. For iPhone/iPad users, download some apps, videos or kid-friendly songs that don’t require an Internet connection. I recommend downloading children’s TV shows episodes that feature popular musicians or actors so adults can be entertained as well. Sesame Street has some great options. Just do a quick Google search for Seasame Street + celebrities for an idea. My faves are Ricky Gervais, Feist, James Blunt and Andrea Bocelli. Definitely worth checking out for the whole family! If you’re buying new, consider the LeapPad from LeapFrog – it’s a kid-version of the iPad and comes with entertainment and learning games for little ones. They’re about $100, but think of it as an investment since they can be used long after the vacation ends. 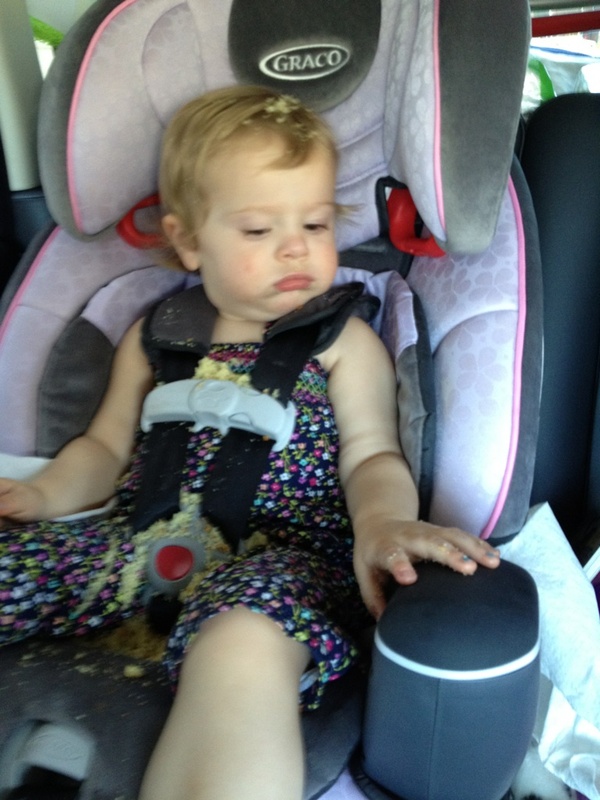 What do you do to keep tantrums and melt-downs at bay on long car trips with kids? Planning to fly soon with your own little ones? 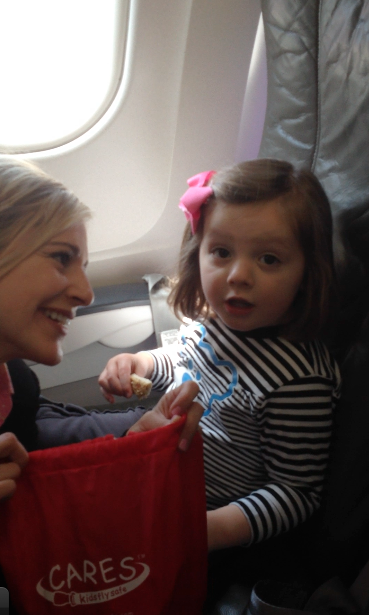 Consider using the CARES* harness on the plane rather than lugging your carseat. Since Little is a tad older now and because I abhor lugging around gear I don’t need, we love the CARES system. We tend to either rent carseats at our destination or be visiting family and friends who have carseats we can borrow. At this sage, with a 3 year-old and a 20 mos. old, I still prefer to travel sans carseat when possible. Of course, that can change based on my children as they grow, or our travel plans, but for now, I’m sticking with our CARES. I wrote a more detailed piece about the CARES installation AND even snapped an ‘in the field’ video of us installing the CARES while on board our last flight. 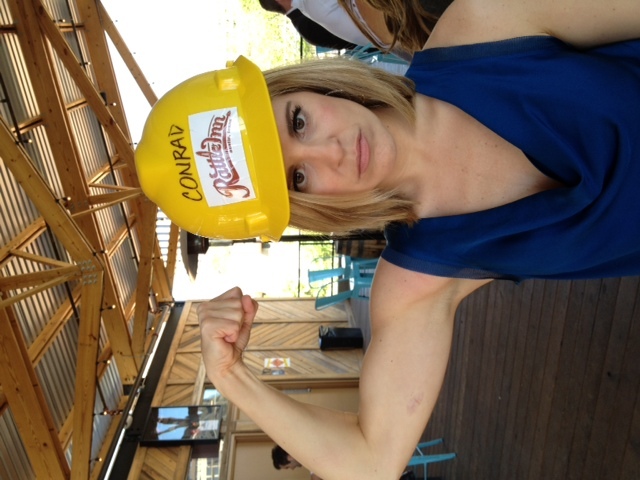 Watch my video on Community at HomeAway. Questions? Comments? I’d love to know your own experiences! * CARES, the Child Aviation Restraint System, is the only harness type child aviation safety restraint ever certified for airplane travel by the Federal Aviation Administration (FAA). Friends! Airport travel with kiddos just got a lot easier. I’m serious. I mean a lot! In fact, I’m traveling solo with my 20-mos old soon and think I need one of these asap for our trip! My good friend alerted me this morning to this amazing chair that actually converts the carry-on bag you’re probably already toting into a stroller of sorts- actually more of a wheeled chair. Meaning, its great for older kids too. It’s called the Ride-On Carry-On and you can read all about it on their site. The site says its good for 8 months to 5 years and up to 50lbs. What’s even better than that? For today only, thanks to Good Morning America, you can get one for just $19.95. I’m looking at how this item works: so simple, so genius, so why didn’t I think of this? Ok, maybe not me. But my girlfriend who told me about it this morning. She totally could have thought this up. Anyway, if it works like it looks on the site-and given the simplicity of it- I’m guessing it does, I’d say GRAB ONE NOW. So go, buy, travel, enjoy!! Oh and take pics and let me know how it goes here. I want to hear from you. Now, more than ever, people work independently or for smaller boutique and start-up companies who can’t afford luxe business travel for their employees. And even for the millions still working at big corporations, my friends all tell me that their travel accounts have seen major cutbacks over the years! Shutter the thought for those friends of mine who live out of a suitcase for their jobs. The reason I’m talking about this is because I’ve done more business travel than usual this year and I started thinking about the places I’ve gone and where I’ve stayed . Here’s what I discovered; there is a time and place for many different types of accommodations and experiences while traveling in general, but I’ve realized this is even true for business travel. I also found out that sometimes business travel can actually mean eating in, sitting on a back patio and waking up to the smell of your own favorite brand of coffee brewing in your own kitchen. All this and on a budget too- it’s true. I was also going to be very near a close friend of mine who I rarely get to see. Then there was the TV prep I would need to do the day before including lots of primping (of course). Putting all of this into consideration, I chose a reasonably priced hotel located somewhere between my friend and work. I was traveling alone and I knew I wouldn’t have anyone to mingle or meet up with once I got back to the hotel every night. I decided I needed to have Internet, hairdryer, iron and ironing board and at least one on-site restaurant. Come March, I was headed down to the heart of Austin for an exciting business trip that would be full of meetings and long days. I knew I wanted somewhere cozy to rest my head at night after amazing, but tough work hours and everyone I knoew told me that SoCo (that’s Austin speak for South of Congress St.) was the neighborhood to be in. Since I was going to be there for a while, I thought a home or vacation rental would fit the bill. I didn’t want to miss out on the local flavor in a place like Austin, so I checked out options on HomeAway.com and found an amazing little duplex home. 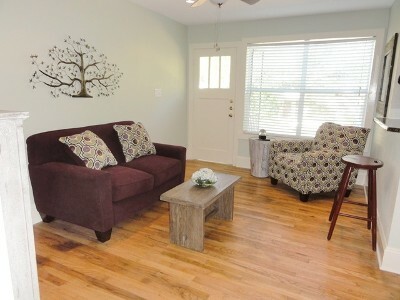 Each side has been gut renovated into 2 charming “rental” options for both short and long terms. One side of the duplex was available for the dates I needed and the price was about $150/night. Much cheaper than any downtown hotel would have been. I was a little nervous at first because I had never done a rental before and assumed that it meant I had to stay in someone else’s home or apartment while they were away. This is not at all the case. Most of these places, I learned through research, are set up specifically for rental. That way I got the privacy of a hotel with out the cost, plus all the benefits of a home: kitchen, laundry, the place I stayed even had an attached carport and grassy back yard. It was so great, that next time I go back to Austin, I’ll most likely book the same place again. It felt like a place I could call home for a few days of work. The owner left me a folder so I could get my bearings including a map, restaurant menus, grocery locations and more. For long-term business travel, or even for business travel in certain parts of the country, I would definitely explore a home rental option. Ok, so a really great conference where constant networking, panels and keynote speakers followed by event after event after event may just require you to stay at a really fab hotel for a few grueling nights. Its tough work, but someone has to do it. Just last week I had the honor and pleasure of joining the most amazing women and marketing and media people I can emagine at Mom 2.0 Summit. As luck had it, it was hosted at the Ritz-Carlton in Key Biscayne, FL. That’s way down at the tip of Florida, like where the water is crystal clear. And its the Ritz-Carlton which pretty much sums it up. Because the conference is so great and so large and has such fabulous sponsors like Honda, LG Electronics, Aldi Foods, Hallmark and more, the Ritz offered a block of rooms to particpants at too-good-to-pass-up prices, making a stay at the Ritz much more of an affordable option for most of us. Besides, no one can miss out on all the activivites and schmoozing that takes place at a big conference like this – so my best be really truly was- to stay at THE RITZ. My ultimate advice when it comes to planning business travel is to save money where you can because in the end, that’s a win for everyone- even you AND mostly, try to squeeze in something fun while you’re away so you can come home at least a little enlivened by this exciting world we live in and the fact that you just got a chance to see it through fresh eyes. Yesterday turned into a full day all about MILK for me. Seems boring? Maybe. Seems like I’m hanging with too many toddlers? Definitely. But a day that usually consists of between 1 and 4 straw cups with luke warm milk in them became an entire day surrounded by MILK. 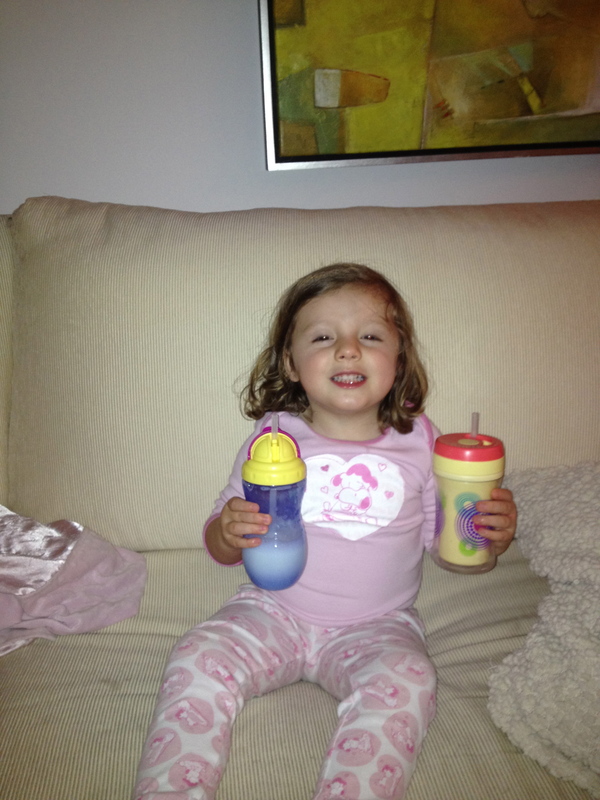 Photo to the left proves the Littles addiction to “hot milts” – that’s how they say it. And they may, at some point in the near future, require an intervention from it. But that was just the start of yesterday as MILK day. I’ll start with the obvious…by now you’ve seen the cover of Time magazine. Clearly sales and subscriptions are down to have felt like the only way forward was such a provocative cover. I, personally, am not getting involved in the mommy battle of the type of parenting one chooses- Hubs and I just spend our days trying to do the best we can at any given moment. What I’m talking about more here, isn’t what the cover story is about- its the cover in and of itself. Why make something natural, like breastfeeding in general,into something tawdry? Does it really just boil down to MONEY? Recently I read that a woman flying out of Hawaii was asked by TSA agents to prove that her breast pump was real!? Does this mean breastfeeding – which is hard enough on its own- has become even harder? Does it mean we are loosing tolerence? If you breastfeed your wrong, If you don’t you’re also wrong? Come one moms, lets all just stand behind each other as we all attack the hardest job on the planet. Finally I was able to attend a MILK event I can really stand behind. I was invited to attend the Got Milk? 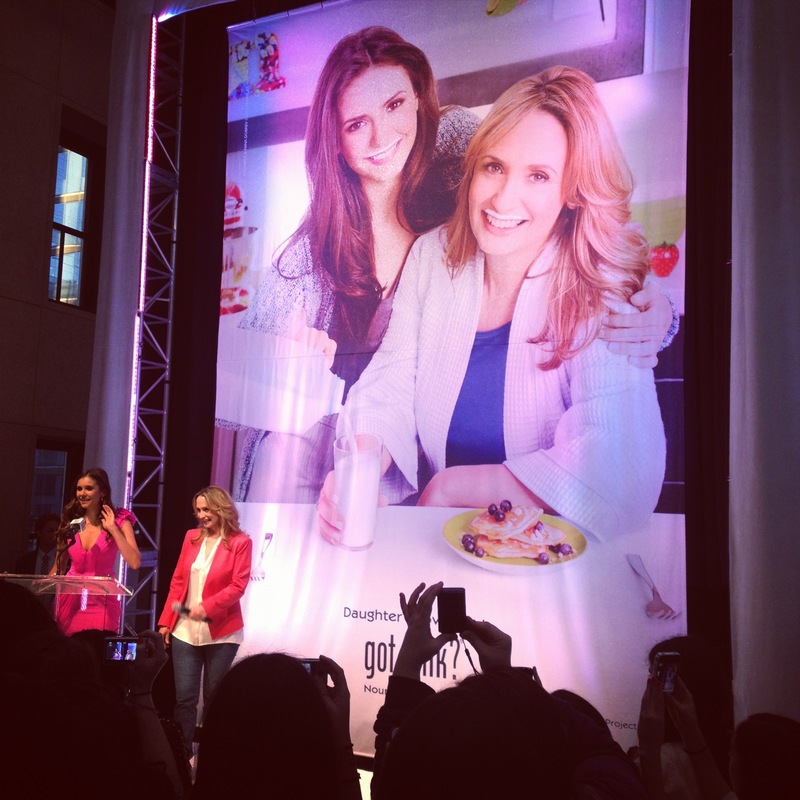 unveiling of its latest ad featuring teen star of Vampire Diaries fame, Nina Debrov and her gorgeous mother, Michaela. The event was hosted in the Hearst Building last night in NYC and was full of fun cereal and breakfast items and of course, lots and lots of Milk. Got Milk? has a new campaign which they launched last night to coincide with Mother’s Day called “Like Her, Like Me” or for you Tweeps #LikeHer. The message encourages bonding among moms and daughters of all ages with a goal of both mom and daughther staying healthy and confident. Nina Dobrev recounted her childhood memories about her mom and breakfast all centered around Milk. What a wonderful, girl power message for Got Milk? Synoposis of MILK day- no matter how you look at it- Milk means mom and kids get to share more and bond more. Now that’s a Happy Mother’s Day! Thanks to Big City Moms for hosting The Biggest Baby Shower Ever tonight in NYC. I had a blast checking out the latest in baby gear. Although the event is full of brands aimed at new parents and parents-to-be, I must say even “mommy experts” (haha) like myself can benefit from events like this! I love staying in tuned to the coolest strollers and carriers and organic squeezie foods available because all of these things still make my life traveling with toddlers easier. Tonight, I saw Bugaboo’s latest Donkey double stroller and I have to say City Select, Joovy and Mamas and Papas (a British brand headed our way) are all doing amazing job competing and giving the Bug a run for its money. And the best thing of all, to my surprise, Jessica Alba was right in front of me at her booth for The Honest Company. Not what I was expecting when I turned the corner, but can I just say she did not disappoint. She was taking pictures with anyone who asked, stay poised among the flash bulbs AND is GORGEOUS!!! What are your favorite go-to travel products when traveling? 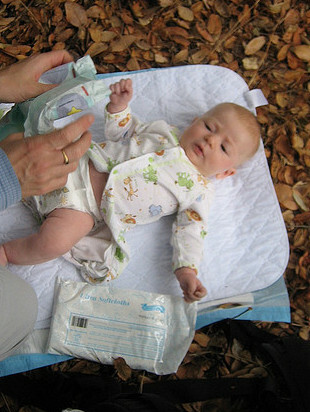 Strollers, carriers, easy-to-pack food items? Let me know!